(March 24): Southeast Asian stock markets took a breather on Friday ahead of a crucial vote on a US healthcare bill that could show whether President Donald Trump can muster the backing needed to push through fiscal measures key to his economic agenda. All eyes in global financial markets were fixed on stuttering Republican efforts to pass a replacement for Obamacare on Friday, with failure likely to undermine faith in Donald Trump's promise to deliver a "phenomenal" US tax reform. Most markets were looking for cues from developments inmajor economies, particularly the United States, said Jose Vistan, an analyst with Manila-based AB Capital Securities, adding markets were consolidating due to a lack of firm triggers. Singapore shares ended 0.5% higher after the city-state reported that factory output in February rose 12.6% from a year earlier. The index fell 0.9% on week, its first weekly decline in seven weeks. Vietnam ended up 0.4%, after earlier hitting its highest in more than nine years. The index posted a weekly gain of 1.6%, snapping three straight losses on week. Vietnam Joint Stock Commercial Bank for Industry and Trade rose 1.1%, while Petrovietnam Gas Joint Stock Corp closed 2.4% higher. 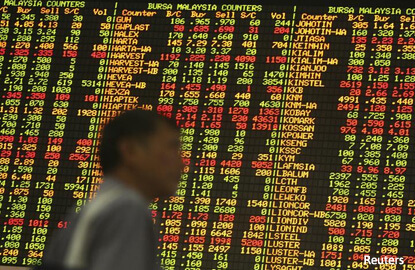 Thailand rose marginally, with energy stocks contributing the most to gains on the index. PTT PCL was up 1.5%. The index added 0.8% for the week. Philippine shares closed 0.4% lower, dragged down by financials and utilities. The index lost 1% over the week. SM Prime Holdings Inc lost 1.1%, while Jollibee Foods Corp closed 1.2% lower.